During my first visit to the John Johnson Collection, I had a peek at some Magic Lantern Slides for the first time in my life. I had never seen any before so they held some mystique for me. I knew that lanterns and slides were artefacts from a bygone era that would eventually lead to the development of the cinema. When I opened the first folder of the cinema collection, I was immediately drawn to a set of slides of the first Robinson Crusoe story. There he was building a canoe, exploring in his outfit of goat hides, finding footprints in the sand, etc. On arriving home that night I set out to find a copy of the book which I have been working my way through. I recently catalogued this set of images. 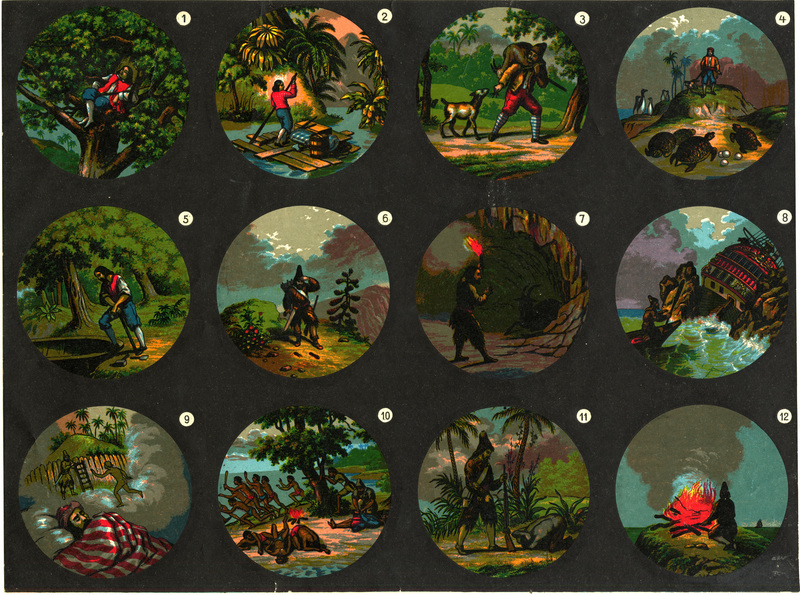 There are twelve illustrated scenes that were transfer printed on paper by Theobald & Company, London. Lanternists would cut the transfers into squares and position each between two pieces of glass to form a magic lantern slide. These slides would then fitted into a slide holder which would eventually be placed into a magic lantern during a show. Try as I might, my efforts to find the associated printed lecture have been unsuccessful. Therefore I used my knowledge of the story (reading Daniel Defoe’s novel was key) to help ascribe classification terms to the images. However, I had difficulty with one slide in particular. Slide number eleven was mysterious. What is happening there? Is Crusoe subjugating a human? The fact that the person is shirtless and is prostrate in front of the armed Crusoe leads me to think that it is Friday thanking Crusoe for saving him from cannibals. However, this idea does not fit with the chronology of the preceeding slide: number ten shows Friday helping Crusoe free his father and a Spanish Castaway from a group of armed men. By this time the two had already met and become friendly. Who could it be, then? Maybe it was Friday’s father, whom they saved in slide ten, but I could not corroborate this. Because of it’s vagueness, I have decided to avoid affixing a narrow classification term to the slide. Instead, I will use “lifesaving” and “rescue” to describe slides ten and eleven as a set. How would you have described this enigmatic slide? ‘Comic’ valentines are the dark and lesser-known side of the tradition of sending valentines. Far from the lace paper, tinsel, scraps and feathers of the traditional elaborate valentine, they are simply and crudely printed on single or folded sheets, and coloured by stencil. While this is also true of cheaper valentines, it is the content which surprises. 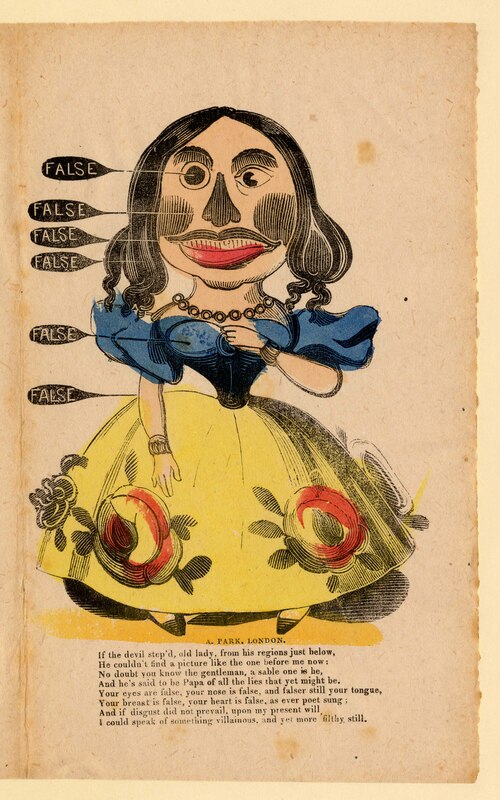 Both illustration and text were intended to insult the recipient who (before pre-paid postage was introduced in 1840) had to pay to receive them. John Johnson collected 20 boxes of valentines (of which 4 are comic) and several albums. The valentines collected by Walter Harding are also kept with the John Johnson Collection, and these include 14 boxes of later American comic valentines, published by McLoughlin Bros. of New York. While in England the valentine itself diminished in popularity and quality at the beginning of the 20th century and the vogue for ‘comic’ valentines with it, some of the McLoughlin comic valentines were published as late as 1963. The exhibition leaflet which accompanied 2010 display of valentines: The Season for Love: a collection of choice valentines from the John Johnson Collection is online, together with the poster, and images of the exhibits with captions. 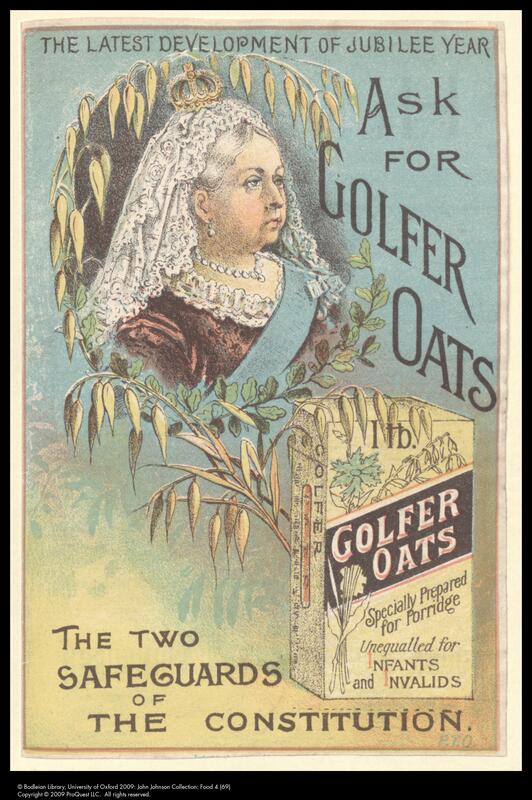 2012 is a wonderful year for topical ephemera: two days ago there was the anniverary of the Queen’s accession, for which I tweeted one of my favourite advertising images from the Diamond Jubilee of Queen Victoria: ask for Golfer Oats. Yesterday, was Dickens’ bicentenary and I put up a new image gallery on the Johnson website. The Bodleian exhibition Dickens and his world, which will include many ephemera, runs from June 2 to October 27. Next week, the focus will be on Valentines, with extra impetus from the Ask Archivists initiative, (Twitter #loveheritage). Then more for the Jubilee and the Olympics. Watch this space! This evening is the official opening of the Bodleian’s superb new exhibition The Romance of the Middle Ages. 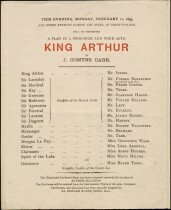 As the exhibition curator explores his theme across the centuries, I am delighted that he displays a programme for King Arthur at the Lyceum with Henry Irving and Ellen Terry in the cast, music by Arthur Sullivan and costumes by Edward Burne Jones. The John Johnson Collection is often used in exhibitions and smaller displays and there have also been three major Bodleian exhibitions showcasing the Collection. The first was in 1971 and was curated by Michael Turner, who brought the Collection from the Oxford University Press in 1968. The catalogue: The Johnson Collection, catalogue of an exhibition is the standard work on the history and formation of the Collection and the text is online as a pdf. We hope to add images of the exhibits in due course. The most recent is Children’s Games and Pastimes, which I co-curated in 2006 with Clive Hurst. The guide to the exhibition is online. Smaller displays have included The Season for Love: a selection of choice valentines and The London Year: London Transport Posters of the 1930s (both in 2010). I am already looking forward to the forthcoming major Dickens exhibition. 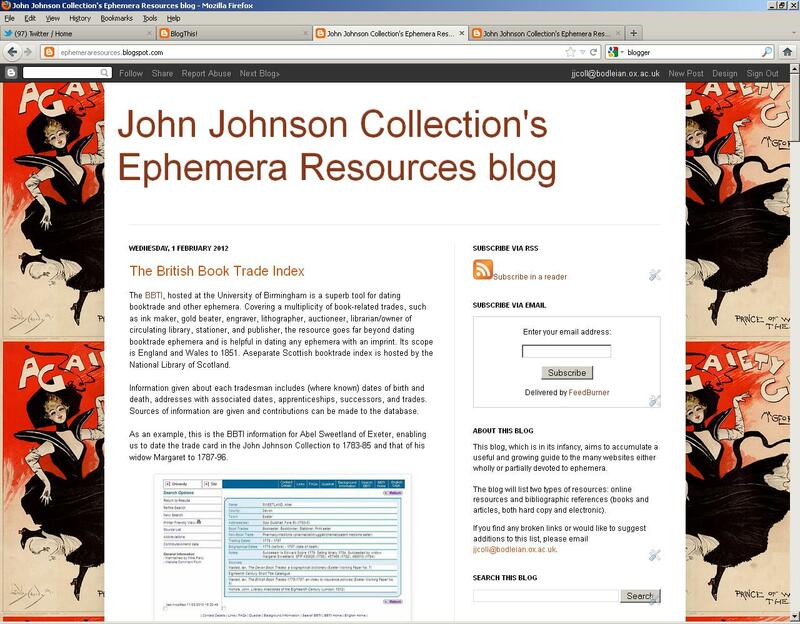 The John Johnson Collection Ephemera Resources blog, which now has 60 posts, aims to accumulate a useful and growing guide to the many websites, books, articles, exhibitions and blogs either wholly or partially devoted to ephemera. In the course of my work, I often refer readers and enquirers to other collections and see this as an easy and attractive way to build up lists of resources, both electronic and non-electronic, for a wide range of subjects and issues (such as dating, conservation and crowd sourcing) through tagging. I include screen shots wherever possible and am learning a lot about the ways in which other institutions and ephemerists surface their ephemera online.